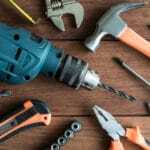 Home » Blog » Which Power Tools Do You Need Around the House? Which Power Tools Do You Need Around the House? 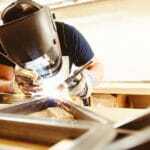 Many homeowners at one time or another will find themselves wanting power tools. Power tools make it easier to perform home improvement projects and make repairs. Power tools also help hobbyists who like to build things in their garage. 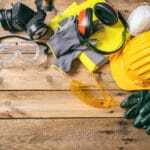 New homeowners and people who are new to making home improvement projects can find the world of power tools intimidating. This list will help someone who hasn’t yet invested in power tools to find the right tools for them. Many homeowners use their power drill more than any other tool in the tool box. A power drill is useful for installing blinds, hanging shelves, installing curtain rods, and adding planter hooks to ceilings. Drills can even be attached to augers which can help churn wet concrete or dig holes in the ground. A power drill can get heavy use from people who regularly make improvements to their home. So it’s important to buy a good brand that will last for a long time. Power drills generally come in cordless and corded varieties. When trying to choose a drill, it’s important to consider a variety of factors including voltage and speed. Power drills have different speed settings for different tasks. Voltage is important for cordless drills, because the voltage determines how much strength the tool has to overcome resistance. Power saws make it easier to repair a home, whether it’s to build a deck or an arbor, make a set of shelves or remodel a room in the home. There are a variety of different types of power saws on the market. Homeowners who don’t know which type of saw is right for them may find themselves building up a collection over time. The jigsaw is a saw with a fine blade that can cut through a variety of materials, including hard and soft wood and metal. Jigsaws are useful for making curved or straight cuts, but the evenness of the cut can be difficult to control. For homeowners who want a straight cut, a circular saw or a table saw is usually better. A table saw consists of a circular blade that remains in place while the object being cut is moved toward the blade at an even pace. A circular saw is similar to a table saw except that it is not attached to a table. Circular saws are portable and can be used outside or inside for a variety of household projects. In fact, some circular saws can even be used to cut through stone. Stone can be useful for tiling, paving, building garden beds and so on. Finally, a miter saw is a saw that can be used to cut angles in wood. Miter saws are useful for homeowners who need to build a deck or a shelving unit, or angle the ends of an arbor. An orbital sander is a power sander that rotates a piece of sandpaper very quickly. Orbital sanders are useful for performing painting projects if the exterior paint must be removed first. Orbital sanders are also useful for homeowners who work with wood to build structures. If you’re a homeowner who is new to the world of power tools, you may build your collection slowly over time. And find the best tool box or tool chest to store them in! 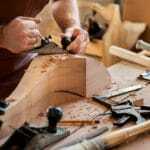 The best way to ensure that your power tools are right for your needs and skill level is to do research before picking a power tool to purchase. Read consumer reviews and talk to experts to ensure that the power tools you pick for your collection are going to meet your needs.